BRIGADIER GENERAL JOHN W. HARRELL JR.
Brigadier General John W. Harrell Jr., was commander of the 438th Airlift, Wing at McGuire Air Force Base, New Jersey. 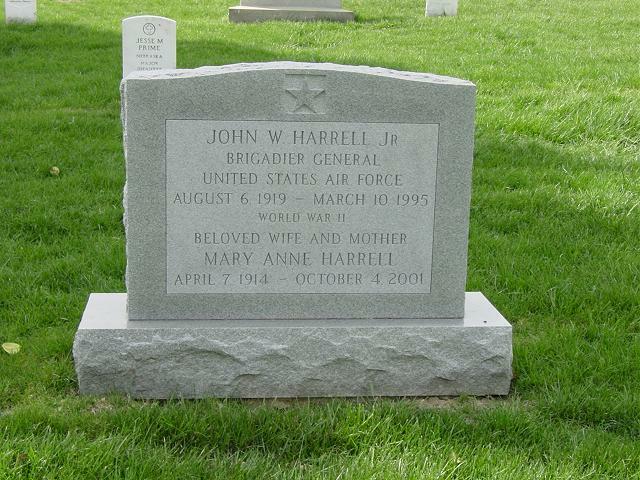 General Harrell was born in Birmingham, Alabama, in 1919. He graduated from the U.S. Military Academy, West Point, New York, in 1942, with a bachelor of science degree and a commission as a second lieutenant, Infantry. He then entered flying training and received his pilot rating in November 1942 and was transferred to the Air Corps. General Harrell was transferred to Sandia Base, Albuquerque, New Mexico, in 1948 and attended the Armed Forces Special Weapons Project school. During almost four years there, he commanded an atomic bomb assembly squadron and then became the Director of Training of a special weapons group which included Army, Navy and Air Force units. assistant for special weapons to the commander Air Materiel Command. General Harrell was assigned as vice commander, 21st Air Force, with headquarters at McGuire Air Force Base, New Jersey, in August 1968, and assumed command of the 438th Military Airlift Wing in August 1969. On Thursday, October 4, 2001, of McLean, Virginia. Wife of the late John W. Harrell, Jr., Brigadier General, USAF; mother of Sharon Huber of Great Falls, VA and Judi Parker of McLean, VA; sister of Dorothy Alexander of San Antonio, TX. Also survived by four grandchildren and three great-grandchildren. Mass of Christian Burial will be offered on Monday, October 29, 2:45 p.m. at Fort Myer Chapel. Interment Arlington National Cemetery. In lieu of flowers, if desired, donations may be made to S.O.M.E., 71 O St., N.W., Washington, DC 20001 or Alzheimers Association, 10201 Lee Hwy., Suite 210, Fairfax, VA 22030.